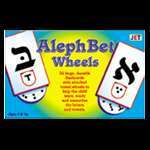 32 large durable Aleph Bet flashcards. Each card is 4.5 in. x 8.5 in. and has a rotating wheel which allows the different vowels to be displayed under the letter. Ages 3+. Hebrew Magnetic Letters - 3 1/2 in.